As the calendar flips to November, the Gulf South moves into the middle of what is known as the second severe weather season. Often, thunderstorms and tornadoes are associated with spring; but as periodic cold fronts move in from the north, a clash with lingering warmth and humidity can spark some nasty weather. This should come as no surprise in Louisiana as November has averaged more tornadoes than any other month besides April over the last 25 years. 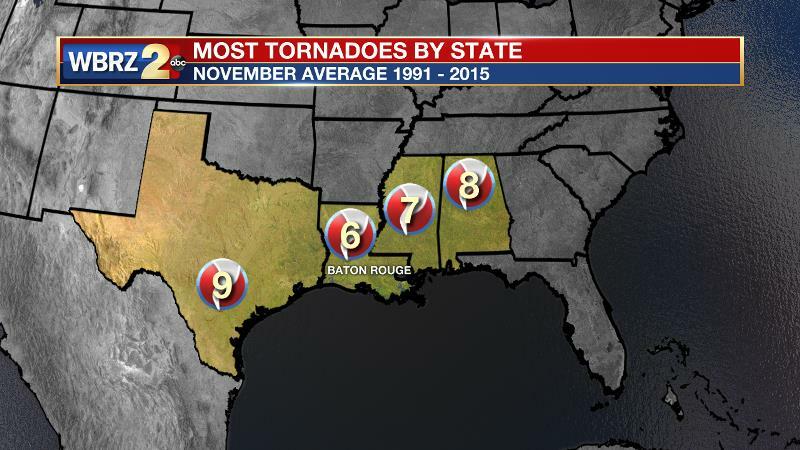 Louisiana also has averaged the fourth most November tornadoes by any state since 1991. A deeper look at tornado statistics confirms that severe weather in the middle of the fall season is common. From 1991 to 2015, there have been 131 confirmed tornadoes in the 13 Parish, 3 County WBRZ Weather Forecast Area resulting in 3 deaths, 34 injuries and 17 million dollars in property damage. Of those tornadoes, 34 (26 percent) occurred between October 1 and December 31. Almost half of those happened in November. More recently, the WBRZ Weather Forecast Area has had some bad luck with weather in December, around Christmas. In 2012, an outbreak occurred on Christmas Day producing two separate EF1 tornadoes in Wilkinson and Amite Counties. Two years later, the strongest local cool season tornado of the last five years occurred in Tangipahoa Parish as an EF2 significantly damaged parts of Amite on December 23, 2014. As always, meteorologists look to large-scale climate patterns to get an idea for what weather may be coming down the road. 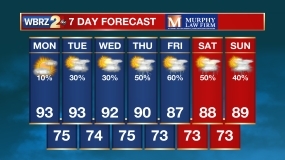 So, what is in store for this upcoming cool season? The Climate Prediction Center notes no presence of El Niño or La Niña right now. However, a La Niña pattern is expected to develop over the next few months. 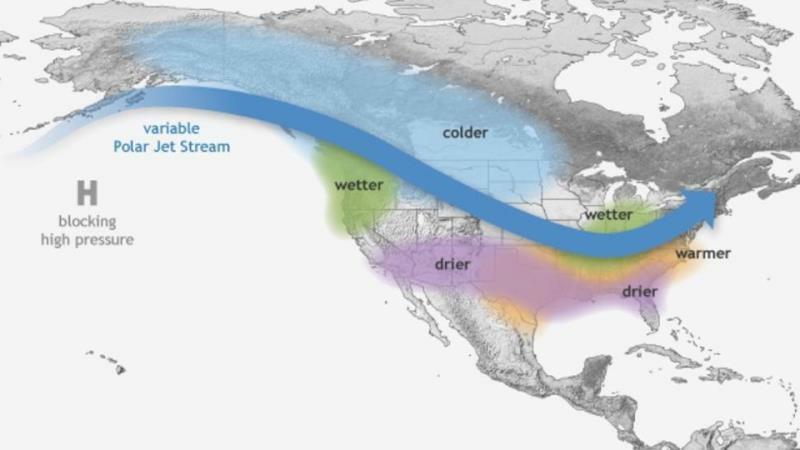 In the Southeast, La Niña often leads to warmer and drier than average conditions during the cool season. It is important not to confuse such an outlook for meaning—no cool and stormy spells—rather overall, the cool season should average out to be warmer and drier. Of course, La Niña also has implications for severe weather. Over the last 25 years, La Niña has resulted in fewer fall tornadoes than average and far fewer than during an El Niño fall. These trends are less pronounced, even reversed, farther north and east of Louisiana. 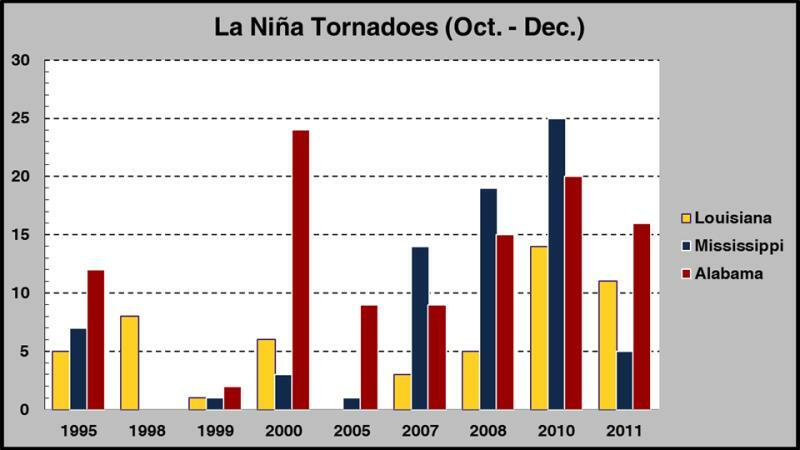 From 1991 – 2015 there were nine La Niña episodes producing a range of outcomes with regard to tornadoes. 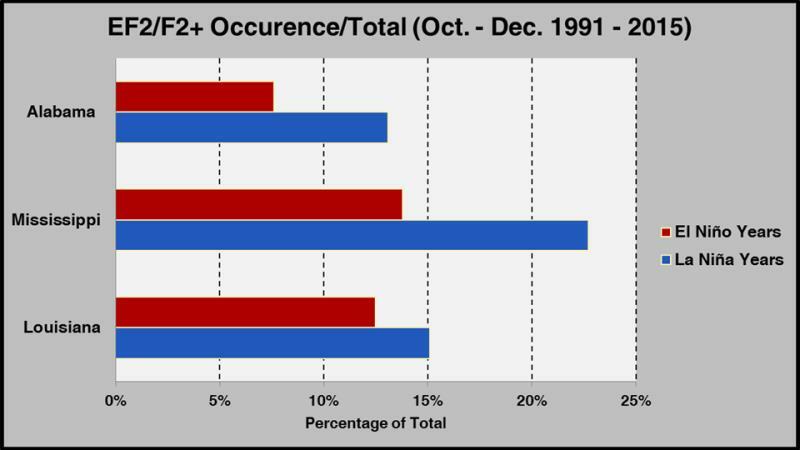 As many as 14 and as few as zero fall tornadoes have occurred during La Niña episodes over the last 25 years. The magnitude of the La Niña seemed to have no bearing on the number of tornadoes. There also seems to be a link between La Niña and fall tornado strength. 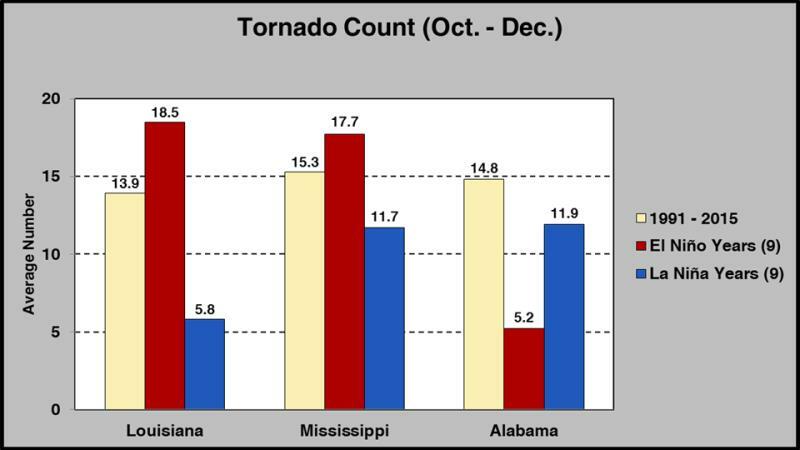 Across the board, from Louisiana to Mississippi to Alabama, La Niña events during the fall season have resulted in more EF2 or stronger tornadoes than during El Niño events. In Louisiana, 15 percent of all tornadoes from October to December over the last 25 years have been EF2 or stronger. In summary, the statistics suggest that the chances for tornado events will be lower than usual this season, but there is perhaps a better chance for a strong tornado if severe weather does occur. Those statistics are simply some information to snack on. No matter what the data suggests, any season can bring any type of weather. As we just begin to let our guard down on hurricane season, there are a few things to be aware of as severe weather begins the main weather threat through to next June. 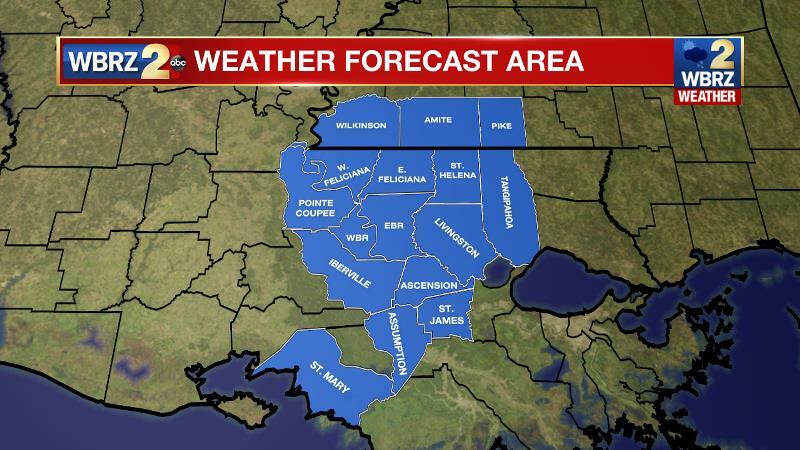 1.What do you mean when you say, “the forecast area?” The WBRZ Weather Forecast Area consists of 13 Parishes and 3 Counties around Baton Rouge, including: East Baton Rouge, Ascension, Assumption, East Feliciana, Iberville, Livingtston, Pointe Coupee, St. Helena, St. James, St. Mary, Tangipahoa, West Baton Rouge, West Feliciana, Amite, Pike and Wilkinson. 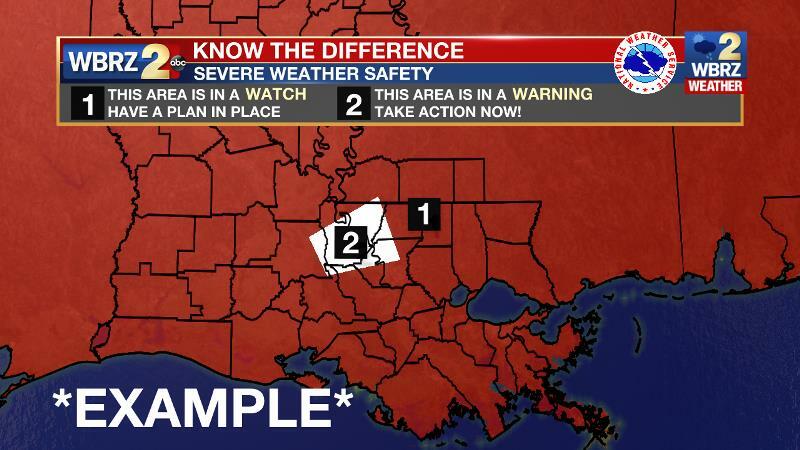 So if you hear mention of the WBRZ Weather Forecast Area and live in one of those parishes or counties—we are talking to you! 2. When severe weather is a possibility, the Storm Prediction Center will first issue outlooks. These outlooks highlight areas that have a threat of severe thunderstorms and how high the threat is, by five categories ranging from marginal to high. Another way to consider the outlooks is on a scale of 1 to 5 with 5 being the highest. Keep in mind, even in a “marginal (1)” or “slight (2)” risk outlook, the chance for a severe thunderstorm is much higher than on a normal day. These outlooks are based on the probability that severe weather will occur within 25 miles of a given location. If you are in the outlook area, that means within 25 miles of you! 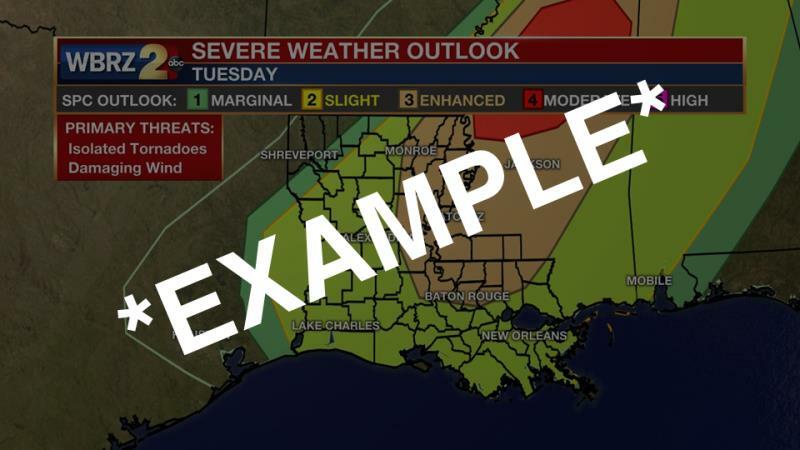 If one of these outlooks is issued for your area, stay in touch with the WBRZ Weather Team for additional information in case any watched or warnings are issued. Since we are talking about percentages, sure, a 1 in 10 chance of a tornado does not sound that bad. But, think about it as a 1 in 10 chance you could be injured or killed and suddenly the need to pay attention seems a little higher! 3. Do you know the difference between a watch and a warning? Simply put, a warning is more urgent than a watch. A warning means you need to take action immediately to protect yourself from harm while a watch means you should pay extra attention to the weather and have a plan in case severe weather occurs later. 4. What action should you take during a tornado? What is a severe thunderstorm? How to I stay safe during flash flooding? We have an entire severe weather safety portal RIGHT HERE dedicated to making sure these important answers are at your fingertips. Review, bookmark and stay ready!